Photograph by Dr. Anteneh Roba, taken in Ethiopia. I must go back a few short weeks. One day a letter arrived in our website inbox from Dr. Anteneh Roba of The Amsale Gessesse Memorial Foundation in USA. Dr. Roba's letter conveyed to us the pitiful situation for thousands of dogs in Ethiopia, and especially Addis Ababa, where most are starving, neglected, unwanted and sometimes killed to reduce numbers and risk of disease. Dr. Roba explained that his organisation is launching a fund to build a shelter/clinic with educational outreach capacity to try to save some of the dogs currently roaming the streets, hungry, with nowhere to go and often trailing puppies behind them, mothers that cannot feed themselves let alone a family of pups. A terrible scene that Dr. Roba had witnessed on his last trip to Ethiopia has stayed with us, the story of puppies drowning in puddles because they were too weak to hold up their own heads. We had to do something. Well, this is it. A song to help raise funds. It's a very personal song for Paul and I, we feel like blood, sweat and certainly tears went into creating it. I hope you will be able to share 'One Small Dog' with your friends and groups and buy a download copy from the Amsale Gessesse Memorial website. Thank you to Dr. Anteneh Roba for bringing this situation to our attention. Thank you to the HAPS team in Ethiopia (Homeless Animals Protection Society) for their dedication to the most difficult duty. Thank you to Janice Blue of KPFT FM, Go Vegan Texas Show, for such amazing support. Thank you to Mary Alice Pollard, Cornwall's Voice For Animals, for giving us so much time and support from day one. And thank you to everyone who has been there for us every step of the way as we continue to write songs for the forgotten. We are grateful to be counted as your friends. 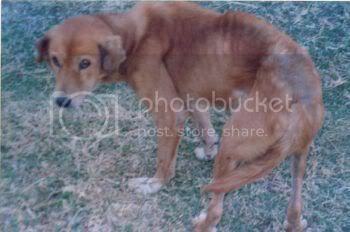 Regarding the overpopulation of stray dogs in his native country Ethiopia, many of the dogs there are starving and neglected. Dr. Roba explained to me his intention to open a rescue shelter/clinic, with educational outreach capacity, in order to raise animal welfare standards in Ethiopia, and especially in the city of Addis Ababa where there are estimated figures of some 750,000 homeless dogs, 95% malnourished and hungry. The founders and volunteers are working round the clock to provide safe haven for as many animals as possible and they are doing remarkably well in difficult circumstances but more help is always needed. Now, some amazing news that was made possible by all of the people above! HAPS Rescue Team Report on the rescue of the dogs in Gido washa/Gido Cave. The place where dogs are thrown alive. 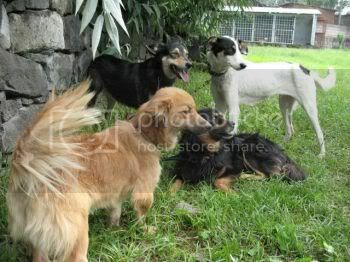 According to our report on June 2007 four dogs were found in the cave as shown in the picture. Our next step was to gather information from the local community and veterinarians before taking any action to get in to the cave. Based on this we consulted three different veterinarians including HAPS Vet for the possible behavioral change and its consequence that may arise due to being troubled in such very harsh condition for days and different people from the area where the cave is located. The advice from the veterinarians was to give them sedative tablet with food to make them feel dizzy to avoid their aggressive behavior if in case. The local people also informed us that this cave was very deep before but this time it is filled up with mud and stones from the surrounding higher areas and so many dogs were buried under while they were still alive due to too much mud getting in to the cave especially during the summer time flood. According to the local community all the time when people feel that they did not want their dog any more they throw to that cave to make sure it will never get back home because there is no way to get out of it. They also pointed out that most of the dogs thrown are female dogs and puppies and pregnant females and they stay some days without food and water during winter when there is no rain water finally die of starvation. And they also told us that no one get in to it since long ago after people started to throw animals in to it, and even suggested the ground may go down when people step on it as it looks very loose while looking from the top and also there is a very bad unapproachable smell. Finally it is decided to give the dogs food for their survival every morning until they get out of there with any possible option available and started to discuss the issue with different people to get more idea and many people suggested that a tall ladder which can fit the hole should be prepared. We then bought a rope and borrowed two metal ladders and fixed them together to fit the height of the hole and organized a rescue team considering all the available information at hand. Then the ground is tested in the other side of the water hole by pushing the ladder down and step the ladder on a flat big stone to keep it tight, the dogs provided with food, putting a sedative tablet in it and finally three people get inside having all the necessary equipment. It was terrible inside, there is a filled up water hole in one side of the cave and it is too muddy and bad smell there was also a heavy rain started after we began our activity, and collecting the dogs takes almost half a day long. We also invited by the Ethiopian National Television to record this event and broadcast it to the public to help create awareness so that people can understand how this action is cruel and look for another option and to show the public how much HAPS paid a life sacrifice to save these poor animals. The four dogs are now at HAPS shelter, they are clean and healthy at the same time we requested the concerned government body to stand beside us to stop people throwing dogs to the cave to make this cave no more a hell for the poor dogs. 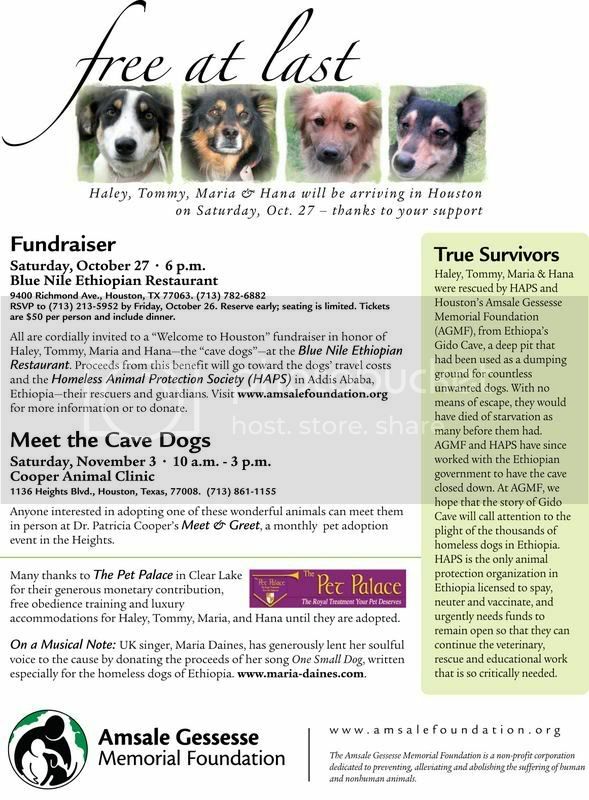 Finally we would like to thank AMSALE GESSESSE MEMORIAL FOUNDATION USA for helping us to rescue these dogs from such a terrible situation without their financial support and strict follow up about the case our success with these poor dogs could have been impossible. Update, today, 13th July 2007, the greatest news! Gido Cave is to be closed so that no unfortunate animals will ever die in that terrible dark hole in the ground ever again, so many helpless animals never made it to daylight and safety but there are four lucky, lucky dogs living at HAPS shelter that were saved from the jaws of death, in my opinion this is the RESCUE OF THE YEAR!!!!!!!!!!!!!!! We have the greatest admiration and respect for the HAPS team and we hope you will continue to do such fine work for animal welfare for many years to come. I am a physician who lives in Houston, Texas. I am a US citizen but originally from Ethiopia. In November of 2006 I co-founded an organization dedicated to the memory of my mother who I lost when I was at a tender age of 5. Maybe because of the loss of my mother at such a tender age made me more sensitive to the suffering of others both human and nonhuman animals, which has lead me to co-create this organization dedicated to helping all sentient beings. In April of 2007 I went back to Ethiopia to find out about the wildlife situation in my native country, while there I was confronted with an overwhelming crisis namely the huge numbers of homeless dogs who are, among other nonhuman animals, the most mistreated, abused, neglected sentient beings in Ethiopia. Their suffering so bothered me, a day does not go by that I don't think of them. I saw so many hungry sick, neglected dogs it was stupefying. I have videos of mother dogs in the middle of busy streets in the middle of the day so dehydrated their skin could be raised like a tent, trying to breast feed 10 baby puppies at a time. I have videos of dogs being systematically poisoned by strychnine, continuously convulsing and foaming at the mouth until their rib cages stops moving and they stop breathing. Because of what I have seen I have decided to mount a campaign to bring awareness to the problem in Ethiopia. I know the suffering in other countries are similar but unlike Ethiopia, in India for example, there are at least over 10 great animal protection organizations. In Ethiopia the awareness to the plight of nonhuman animals especially domestic animals and farm animals is nonexistent. There is one organization that I am supporting mostly from my own pocket called the Homeless Animal Protection Society. The only one I know in Ethiopia that deals with dogs among other nonhuman animals. They are under funded, understaffed and in their current situation they will not be able to bring relief to the suffering of a fraction of the 750,000 dogs found in the capital city of Addis Ababa alone. The need for education and the need to create facilities to take care of the thousands and thousands of suffering dogs is needed desperately. What my organization would like to do is create a state of the art spay/neuter clinic/hospital with 6 surgery rooms, an educational center, a center for community outreach and teaching center, a temporary shelter that can accomodate 50 to 60 dogs with a holding area for at least 10 to 20 dogs. We want it to be the best available in Africa so that we can have people from other African countries come and train to do procedures but also to teach them about animal welfare. So when they go back to their respective countries they can spread the word and help their own nonhuman animals. To this end we have already secured the help of veterinarians in the USA who would go to Ethiopia for a couple of weeks at a time to teach. We have been promised by the mayor of Addis Ababa we would be given land to build the facility on. We have the man power already in place in the city. We have already contracted an architectural engineering firm to do the work. The architectural drawing will be created shortly. What is left is to secure the funding necessary to make it reality. This is our vision we can't do it by ourselves. We need the goodwill of people like yourself to make the dream a realty. To spread the word to help. Media exposure is huge, unless people know about the problems they cannot help. Our thanks to Nic Treadwell, presenter of the ever popular Homegrown podcast (for new poetry and music) for playing 'One Small Dog' on this week's show. Your support is greatly appreciated!